There are 3 Assisted Living Facilities in the Camden area, with 2 in Camden and 1 nearby. The average cost of assisted living in Camden is $3,560 per month. This is higher than the national median of $3,346. Cheaper nearby regions include Elgin with an average starting cost of $3,212. To help you with your search, browse the 9 reviews below for assisted living facilities in Camden. On average, consumers rate assisted living in Camden 4.2 out of 5 stars. Better rated regions include Heath Springs with an average rating of 5.0 out of 5 stars. Caring.com has helped thousands of families find high-quality senior care. To speak with one of our Family Advisors about assisted living options and costs in Camden, call (855) 863-8283. The oldest inland city in South Carolina and the seat of Kershaw County, the city of Camden is home to a sizable senior demographic, as more than 20 percent of the population are seniors 60 and over. Camden is also home to two assisted living facilities, with a further 19 located close by. In South Caroline these facilities are called residential care facilities. As resident, seniors can expect to receive help from trained staff members with activities of daily living like dressing, bathing and medication assistance. There may be some facilities equipped to provide specialized care for seniors with disabilities. South Carolina's Department of Health and Environmental Control regulates and licenses residential care facilities in Camden and the rest of the state. There are various cultural attractions in and around Camden that seniors may enjoy such as the Camden Archives and Museum, the Camden Revolutionary War Site and the Camden Antiques Market. Camden has an array of resources for seniors, including the Camden Senior Center, which provides health and wellness programs, daily meals, educational activities, bingo and other games, guest speakers and recreational activities. Seniors who live on fixed incomes may be pleased to learn that Camden’s cost of living index of 99 is slightly below the national average, which is 100. The state of South Carolina is one of several that don't tax social security checks. This can leave more funds in seniors’ budgets to help pay for assisted living care. Seniors who choose to use public transportation can rely on the Santee Wateree Transportation Authority. Seniors aged 65 and older can ride for half-fare rates with proof of age. The average annual crime rate in Camden is 9,549 per 100,000 people. This is substantially above the national average of 2,837 crimes per 100,000 people. Seniors concerned about public safety may be concerned about this elevated rate. Assisted Living costs in Camden start around $3,560 per month on average, while the nationwide average cost of assisted living is $4,000 per month, according to the latest figures from Genworth’s Cost of Care Survey. It’s important to note that assisted living rates in Camden and the surrounding suburbs can vary widely based on factors such as location, the level of care needed, apartment size and the types of amenities offered at each community. The state of South Carolina doesn't currently provide financial assistance for seniors who need care in an assisted living facility. 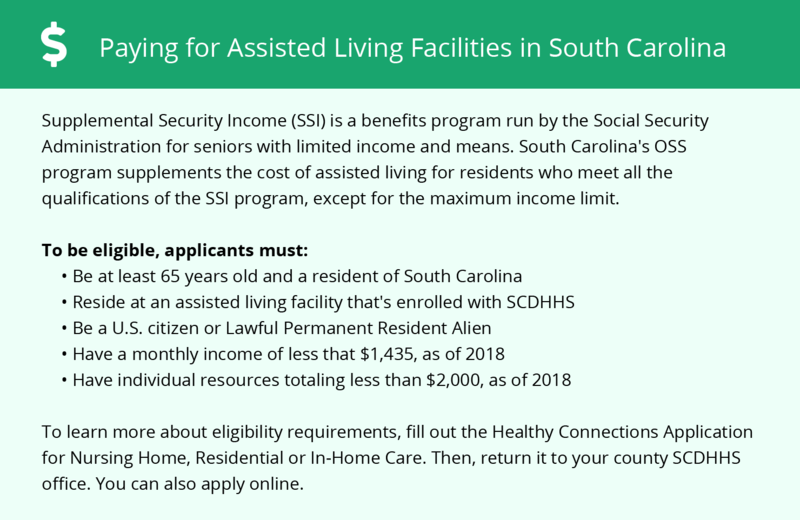 At this time, South Carolina offers waivers to help seniors pay for assisted living care in their homes or to pay for care in a nursing home facility. 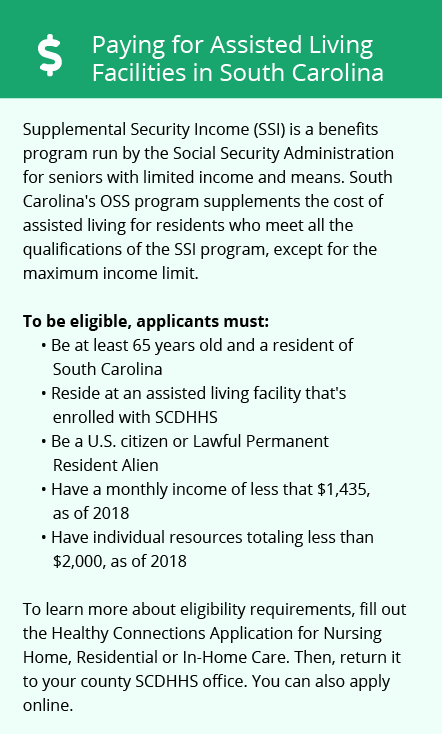 Seniors who receive SSI benefits may qualify for some type of financial assistance to pay for an assisted living facility. Camden and the surrounding area are home to numerous government agencies and non-profit organizations offering help for seniors searching for or currently residing in an assisted living community. These organizations can also provide assistance in a number of other eldercare services such as geriatric care management, elder law advice, estate planning, finding home care and health and wellness programs. To see a list of free assisted living resources in Camden, please visit our Assisted Living in South Carolina page. Camden-area assisted living communities must adhere to the comprehensive set of state laws and regulations that all assisted living communities in South Carolina are required to follow. Visit our Assisted Living in South Carolina page for more information about these laws.